Renee Henning, 80, of Plato, passed away Saturday, Oct. 27, at St. Mary’s Care Center in Winsted. Funeral service were held Thursday, Nov. 1, 1 p.m., at St. John’s Lutheran Church in Plato, with interment following in the church cemetery. Pastor Tyson Mastin was the officiating clergy. Yvonne Schuette was the organist and “How Great Thou Art,” “Amazing Grace,” and “What A Friend We Have In Jesus” were the congregational hymns. Jake Hanson, Zach Hanson, Jim Klaustermeier, Jerry Schwartz, Norma Henning, and Jeff Hanson were the casket-bearers. Renee Henning was born Nov. 29, in Watertown. She was the daughter of David and Alice (Jones) Peterson. She was baptized as an infant Jan. 6, 1938, and was later confirmed in her faith as a youth on April 25, 1952. She grew up on the family farm in Watertown. Mrs. Henning received her education in Watertown and was a graduate of the Watertown High School Class of 1956. She furthered her education at Augsburg College. Aug. 22, 1959, Renee was united in marriage to Daryl Henning. After their marriage, the couple resided in Plato. Renee and Daryl were blessed with three children. She was a loving mother and homemaker. Renee and Daryl owned and operated Plato Grocery and Henning Painting & Decorating. Mrs. Henning was employed at UMCO in Watertown and Telex in Glencoe. She and Daryl shared 17 years of marriage before he passed away March 4, 1977. Mrs. Henning was a member of St. John’s Lutheran Church in Plato. She also volunteered at the Plato grade school as a photographer. Mrs. Henning enjoyed embroidering, cooking, baking cookies, fishing, reading, loved animals, especially cats and dogs, and sports. She also cherished the time spent with friends and with family, especially her grandchildren, great-grandchildren and visits from Savannah at St. Mary’s Care Center. 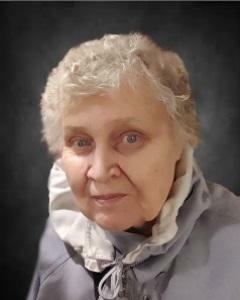 When Mrs. Henning needed assistance with her daily care, she became a resident of St. Mary’s Care Center in Winsted in 2017, and passed away there Saturday, Oct. 27, at the age of 80 years. Blessed be her memory. Mrs. Henning is survived by her children, Susan Hanson and her husband, Jeff, of Rochester, Dan Henning and his wife, Norma, of Glencoe, Dwight Henning and his wife, Sarah, of Faribault; grandchildren, Zachary Hanson and special friend, JoHanna Pearce, of Rochester, Jacob Hanson of Rochester, Sara Georges and her husband, Nick, of St. Cloud, Tracie Henning and her special friend, John Segler, of Glencoe, Kyle Steinborn of Glencoe, Elizabeth Westermann and her husband, Steve, of Midland, Mich., Melissa Henning of Faribault; seven great-grandchildren; nieces, nephews, other relatives and friends. Mrs. Henning was preceded in death by her parents, David and Alice Peterson; father-in-law & mother-in-law, Adolph and Freida Henning; husband, Daryl Henning; sister, Audrey Johnson; and brother, Wallace Peterson.